We had the pleasure of helping the beautiful couple Fara & Phil make their wedding a day they’d never forget! 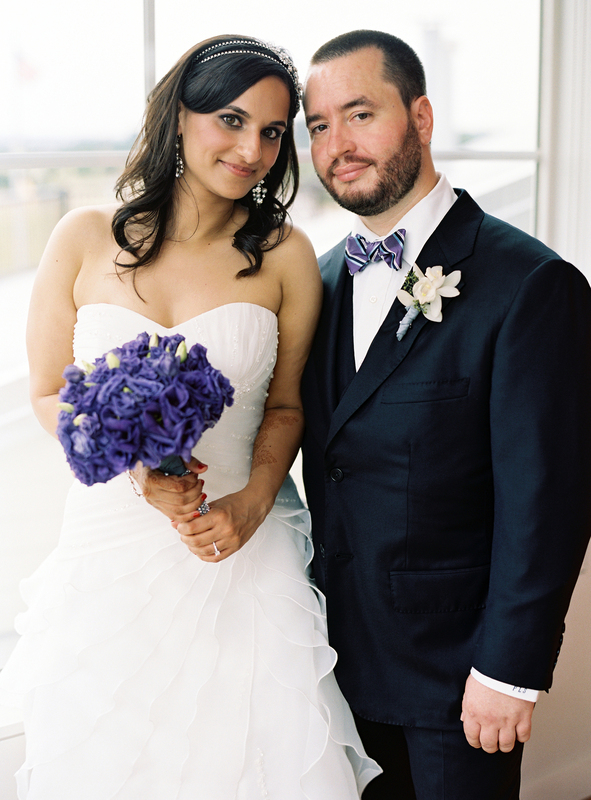 On July 7, 2012, Phil & Fara exchanged their vows in a beautiful multi-cultural wedding that incorporated elements of both Indian and Jewish traditions. There was a garland exchange during the ceremony and Fara wore a beautiful plum bridal saree for the reception. In addition, there was the traditional breaking of the glass at the end of the ceremony and Phil and Fara braved the crowd with the hora dance and being lifted in chairs together. What gave the wedding an extra touch was having their dog as the ring bearer! Everything about Phil & Fara’s wedding was elegant and classy – from the understated white decor and beautiful purple floral arrangements, it made the room shine on a beautiful spring day. We want to give a special thanks to everyone who helped make their wedding such an amazing day! The team at Maritime Parc for making the venue look absolutely stunning, Laura Clare Designs and their amazing floral arrangements, Damali NYC, and Karen Wise Photography for capturing the highlights of the day in such a poignant way.